Once again you have arrived at the reveal of the final part of my creation process. I hope it was worth the wait. 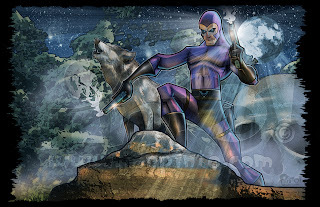 Here he is, Lee Falk's "The Phantom"!! Go back and read Part One if you are falling behind with the inner workings of me creating a picture. I don't really have too much to add to this that I have not already covered in the last post. The work progressed pretty much as planned and was steady sailing. I did create type for the picture, as I am sometimes inclined to do but this time I dropped it from the final as I was not really loving it. I did keep it for the "flat color" version you see here. This is pretty much what the art is looking like before I "paint" it. 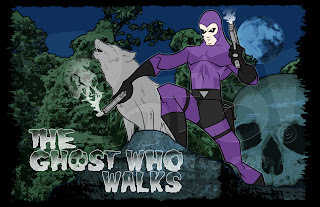 My work is really just jazzed up, textured cartoon art. Here is a progression of the main character. My wife and I recently had the need to re-decorate a room in the house. We decided to have some fun with it and make it useful still. A guest room alone can be limiting so we bought a sleeper sofa instead and made it a lounge area with a bit of a retro, Hawaiian slant. I even painted a GIANT, graphic pineapple in one corner! Mindy found the coolest palm tree lamp and I had the brilliant idea of modifying some old, unused t-shirt designs into a themed triptych to be printed on canvas. They turned out great! I originally would have wanted longer panels but that was not in our budget so we got three 16 x 20 prints and we are very pleased with the results. I wish I had some better pics to share but all I have are what I took with my phone. Enjoy! 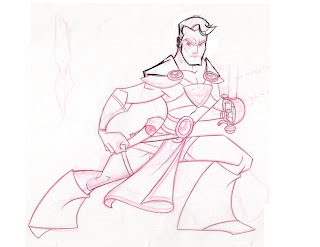 Remember when I did that John Carter piece not too long ago?? Yes? Great! No? Go here and catch up. So, I had many revisions while laboring over that particular picture and entire characters were totally changed. That meant that I had unused artwork laying around my studio. Leftovers. I don't mind having leftovers but my wife Mindy has other thoughts on the subject. Some things get better after sitting for a day or two, like lasagana or socks. You know what I am talking about! So with little free time and with too much procrastination with producing anything new (just kidding. I got new stuff coming. ), I decided to finish off one of the original drawings made for the John Carter picture. A simple finish, just ink and flat color. So what do you think about leftovers?? I'd like to hear your input on the topic. I don't really make it a habit to find other peoples drawings on line and take it upon myself to add color as I see fit. I used to do it when Photoshop was new to me and it was simply good practice but that was a long time ago and I cannot even recall what the picture was that I last colored like that. 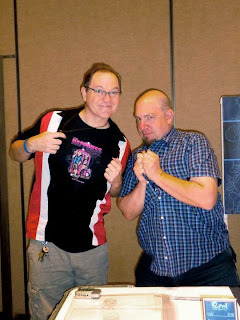 Well, as readers of my blog may know, I am a HUGE fan of the comic artist George Perez. He recently posted a commission piece he did and I could not help myself. I had to color it. 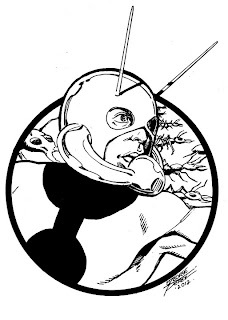 It's an inked head shot of Ant-Man!! You know I love Ant-Man!! 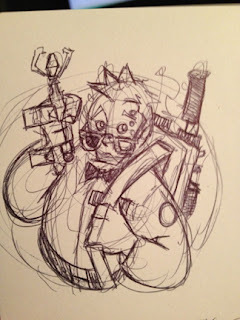 I have a sketch of the character from Mr. Perez myself. You can go and read about it here. I didn't go crazy with the color, didn't want to take anything away from the original and considering how long I have been working with digital color now, I didn't really spend too much time on it either. Was fun!